Another glowing recommendation for us and our excellent engineers. Timely and professional are key aims for us and we didn’t disappoint on this occasion. Blocked drain or toilet? Overflowing manhole? Camera (CCTV) survey needed? Get in touch, we’re 24 hour! Your local drainage experts! Covering Swansea, Neath Port Talbot, Carmarthenshire and Pembrokeshire. From blocked drains, to CCTV surveys, to pipe-lining and renovation. 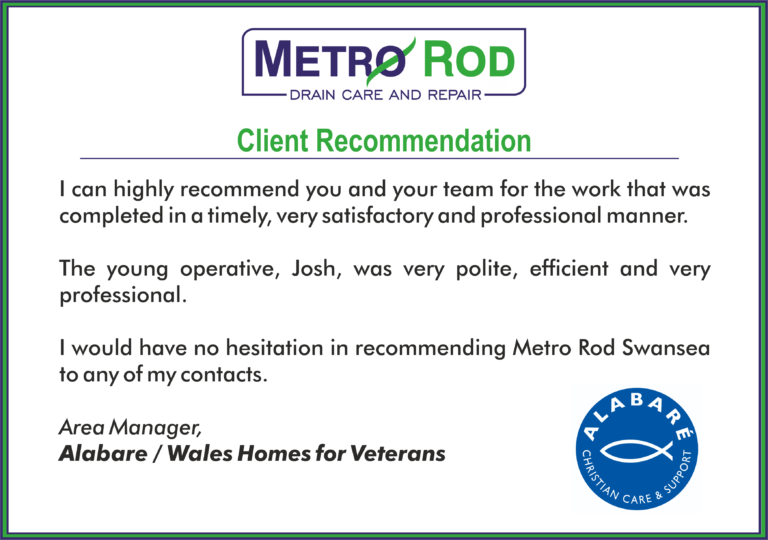 Welcome to Metro Rod Swansea – your local domestic and commercial drainage company, providing extensive solutions to the homes and businesses of Swansea and the surrounding region. We’re available all year round and offer a 24 hour emergency response service 7 days a week. Blocked drains are no problem for us, as our expert engineers have seen it all. We have the solution to all of your drainage problems. Searched ‘Blocked Drain Swansea’ and found us? You can be assured that we have the experience and expertise to do the job well. Metro Rod Swansea has been operating since 2011, based in Ystalyfera just outside Swansea, and since then have built an excellent local reputation. All of our engineers are fully trained to the highest level and are experts in the service they provide, from basic services such as blocked toilets and overflowing manholes, to the more technical side of our business such as drain rehabilitation and detailed CCTV camera investigation services. As a business we are committed to investing in the latest industry technology to ensure a safe and professional service to all our customers. We have the solution to all of your drainage problems! Call us on 01792 863923 or visit www.metrorod.co.uk/swansea. We cover all SA postcodes from Neath to Carmarthen, Swansea to Pembroke including Aberaeron, Ammanford, Boncath, Burry Port, Cardigan, Carmarthen, Clynderwen, Crymych, Ferryside, Fishguard, Glogue, Goodwick, Haverfordwest, Kidwelly, Kilgetty, Lampeter, Llanarth, Llandeilo, Llandovery, Llandysul, Llanelli, Llanfyrnach, Llangadog, Llangrannog, Llansaint, Llanwrda, Llanybydder, Milford Haven, Narberth, Neath, New Quay, Newcastle Emlyn, Newport, Pembroke, Pembroke Dock, Pencader, Pontardawe, Port Talbot, Saundersfoot, Swansea, Tenby and Whitland.